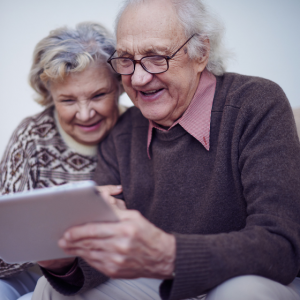 There is a common misconception that technology and seniors don’t mesh. For a portion of seniors, this may be true, and technology may be intimidating. But for a large and growing number of elderly Americans, technology is becoming a way of life. Computers, smartphones, social media, and other devices are helping more seniors live independently. These new trends in technology not only give family members peace of mind, but they can help family caregivers provide even better care. A GPS tracker can be attached to clothing or be worn on the wrist to tell a caregiver or family member a senior’s exact location. Some can even be set to alert a family caregiver – via phone, text or email – when a loved one goes outside of a certain geographical area. Many GPS trackers now come with an SOS button in the event of an accident or emergency. Smart home monitoring solutions, like TruSense, use sensor and GPS technology to provide insight into the health and well-being of a loved one. When a potential safety issue arises, TruSense alerts family members through custom notifications. The senior can also be connected to the TruSense emergency response center with a simple voice command via integration with the Amazon Echo Dot. Family members can even ask Alexa how their loved one is doing anytime using their own Echo device. Pillboxes now include technology. The latest digital pill box can come with an alarm that allows seniors and their caregivers to know what exact pills they need to take and when they need to take them. They can also send out a signal (like a text message or phone call) to let the caregiver know if their loved one forgot to take their medication. These sophisticated boxes are also able to connect to doctors and pharmacies to communicate data on how often patients are taking their medication. Seniors who are living with chronic health conditions, such as high blood pressure, and need to monitor their vital signs regularly, could benefit from a wearable health device. Historically, monitoring an elderly person’s vitals would require frequent trips to the doctor’s office. Today’s wearable health devices can monitor important vitals while at the convenience of the home, including blood pressure, body temperature and other vital health stats. Older adults who are working on healthy weight management or who want to work toward a certain physical activity goal to reduce the risk of mobility loss and chronic illness can use a fitness tracker. These devices are worn like a wristwatch and can track a variety of metrics from heart rate to sleep patterns. Some fitness trackers can also track food intake, which can be quite useful for seniors with dietary restrictions or specific nutrition goals. Wearable health devices provide valuable insights that can help the caregiver understand the health, physical activity, and dietary intake of the senior in their care. According to the Pew Research Center, a rapidly growing demographic group for social media use is people age 65 and older. The study showed 34 percent of seniors use social media sites. Some estimates show that by 2020, as many as 50 million seniors will adopt a social media platform, and the reports are estimating this number to grow exponentially in the years to come. Social media platforms, like Facebook and Instagram, can be used to share experiences and keep in touch with caregivers and family members. It can also help reduce isolation, loneliness and depression. Research has shown that older adults who use social media regularly perform better intellectually and show signs of improved health. Social communication programs like FaceTime, Google Hangouts or Skype provides a senior the tools to chat by video. Video chats are a great way for the family caregiver to keep visual track of any physical changes to their loved one. Programs like Constant Therapy assist people who are living with Alzheimer’s, dementia or recovering from stroke or traumatic brain injury. Individuals who have cognitive deficits can practice memory, attention or language exercises on their digital devices via the Constant Therapy app. Seniors who use Constant Therapy work on tasks connected to slow the cognitive decline associated with aging. How are you or your aging parent using technology to improve overall care, convenience, and quality of life? Feel free to comment below or join our senior and technology conversation we’re having over on our Facebook page. If you’d like to receive news, articles, and information like this each week, subscribe to our weekly blog. Thanks for sharing this article. I would like to add some more on this. High-tech home surveillance devices like security cameras can monitor an older adult’s activities throughout the day and allow you to log in and watch over remotely. You can view if they are active, sleeping, eating, or even if they’ve fallen.